Black evening dress with side flounces and puffed fabric. 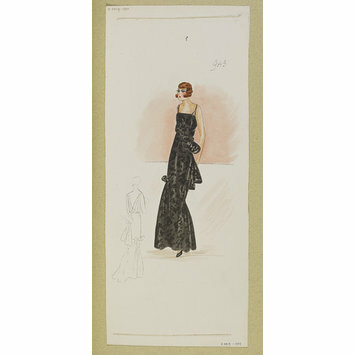 One of 120 dress designs for Winter 1930-31 bound in volume. Paquin (Madeleine Wallis). Black evening dress with side flounces and puffed fabric. One of 120 designs for Winter 1930-31 bound in volume.